For the women's football club, see Middlesbrough W.F.C. Middlesbrough Football Club (/ˈmɪdəlzbrə/) is a professional association football club based in Middlesbrough, North Yorkshire, England. They are currently competing in the EFL Championship, the second tier of English football. Formed in 1876, they have played at the Riverside Stadium since 1995, their third ground since turning professional in 1889. They played at the Linthorpe Road ground from 1882 to 1903 and at Ayresome Park for 92 years, from 1903 to 1995. They were one of the founding members of the Premier League in 1992 and became one of the first clubs to be relegated from it following the 1992–93 season. The club came close to folding in 1986 after experiencing severe financial difficulties before it was saved by a consortium led by then board member and later chairman Steve Gibson. The club's main rivals are Sunderland and Newcastle United. There is also a rivalry with fellow Yorkshire club Leeds United. Middlesbrough won the League Cup in 2004, the club's first and only major trophy. They reached the 2006 UEFA Cup Final, but were beaten by Spanish side Sevilla. The club's highest league finish to date was third in the 1913–14 season and they have only spent two seasons outside the Football League's top two divisions. The League Cup win and the UEFA Cup run was part of an 11-year consecutive stay in the Premier League, before a relegation in 2009. Although the club returned in 2016, instant relegation followed. The club's traditional kit is red with white detailing. The various crests throughout the club's history, the most recent of which was adopted in 2007, incorporate a lion rampant. For a season-by-season record of league and cup performances, see Middlesbrough F.C. seasons. Main article: History of Middlesbrough F.C. They won the FA Amateur Cup in 1895 and again in 1898. The club turned professional in 1889, but reverted to amateur status in 1892. They turned professional permanently in 1899. After three seasons, they won promotion to the First Division, where they would remain for the next 22 years. In 1903, the club moved to Ayresome Park, their home for the next 92 years. In 1905, the club sanctioned the transfer of Alf Common for £1,000, a record fee. Over the next few years, their form fluctuated greatly, rising to sixth in 1907–08 before dropping to 17th two seasons later. The club rose to their highest league finish to date, third, in 1913–14. World War I soon intervened and football was suspended. 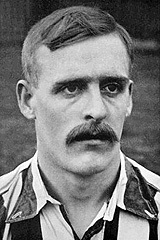 Before league football resumed, Middlesbrough won the Northern Victory League, but the team were unable to maintain their previous form and finished the 1919–20 season in mid-table. They remained in the First Division for the next few seasons, but were relegated in 1923–24 after finishing bottom, 10 points adrift of their nearest rivals. Three seasons later, they won the Division Two title. During that season, debutant George Camsell, who had signed from Third Division North side Durham City the previous season, finished with a record 59 league goals, which included nine hat-tricks. He would continue as top scorer for each of the next 10 seasons. Their tenure back in the top flight lasted only one season, and the club were relegated. They were promoted at the first attempt in 1928–29, winning another Second Division title. The club remained in the First Division until 1954. The decade before the war saw the emergence of Wilf Mannion and George Hardwick, both of whom would go on to become England internationals in the years ahead. Middlesbrough climbed to fourth in the last full season before World War II and were expected to challenge for the title next season, but the war intervened. After the war, the club was unable to recover the form of the previous seasons and hovered around mid-table and exited in the early rounds of the FA Cup. Soon afterwards, the team began to falter, eventually suffering relegation in 1953–54. This was the start of a 20-year spell outside the top division, but saw the emergence of one of the club's top goalscorers, Brian Clough, who scored 204 goals in 222 games, before he left for Sunderland. Over that period, Middlesbrough maintained reasonable progress in the Second Division but were never serious contenders for promotion. After a fourth-place finish in 1962–63, the club endured a steady decline and were relegated to the Third Division for the first time in their history in 1966. New manager Stan Anderson returned the club to the second flight at the first attempt. Middlesbrough would not finish below ninth during the next eight seasons. By 1974, Jack Charlton had taken over as manager and guided the team back to the top flight. They ensured promotion as early as 23 March, and with eight games of the season left, they became runaway champions, finishing with a record 65 points. Middlesbrough won their first silverware as a professional side in the 1975–76 season, lifting the Anglo-Scottish Cup in its inaugural season after a two-legged final win over Fulham. The club experienced severe financial difficulties during the mid-1980s. Middlesbrough were dropping down the table, and finished 19th in the 1984–85 season. In April 1986, the club had to borrow £30,000 from the Professional Footballers' Association (PFA) to pay wages. The final game of the season saw Middlesbrough relegated to the Third Division again. That summer, the club called in the Provisional Liquidator and shortly afterwards, the club was wound up and the gates to Ayresome Park were padlocked. Without the £350,000 capital required for Football League registration, a new rule, it seemed inevitable that the club would fold permanently. Steve Gibson, however, a member of the board at the time, brought together a consortium, and with 10 minutes to spare before the deadline they completed their registration with the Football League for the 1986–87 season. Following the registration came both a change of club crest and a change of the official company name to Middlesbrough Football and Athletic Club (1986) Ltd.
Over the next two seasons, Middlesbrough gained successive promotions into Division Two and then into Division One. The next season, however, they came straight back down to Division Two, and with it came the then British transfer record move of Gary Pallister to Manchester United for £2.3 million. Despite constant promotion and relegation, Middlesbrough were founding members of the FA Premier League for the 1992–93 season. Player-manager Bryan Robson, from Manchester United, took charge in 1994 and Middlesbrough were brought back into national attention. Following promotion to the Premier League and high-profile purchases like Brazilian international Juninho, many considered Middlesbrough to be on the rise. A difficult 1996–97 season, however, was compounded by a deduction of three points imposed just after Christmas as punishment for the club's failure to fulfil a fixture against Blackburn Rovers, which ultimately resulted in relegation. Without the points deduction, the club would have had enough points to avoid the drop. At the same time, the club managed to reach both the League and FA Cup finals for the first time, but lost out in both. Despite being in the second tier, they were again runners up in the League Cup final the next year. Despite losing high-profile players Fabrizio Ravanelli and Juninho due to relegation, Middlesbrough were promoted back to the Premier League at the first attempt, in 1998. The following season saw them settle well and they enjoyed a 12-game unbeaten run midway through 1998–99, including a 3–2 win at Old Trafford in January during which they took a 3–0 lead; it was Manchester United's only home defeat during their treble-winning season. Middlesbrough continued to stay secure in mid-table the following season, thanks mainly to the goals of Hamilton Ricard and the signings of big name players such as Paul Ince and Christian Ziege. In 2000–01, they had a brief relegation scare that was solved with the arrival of Terry Venables as co-manager, and a 3–0 win away at Arsenal in April was the team's best result. The trend of buying European stars continued with the acquisitions of Christian Karembeu and Alen Bokšić. Bryan Robson left the club before the start of 2001–02 season, having served as manager for seven years, and was replaced by Manchester United assistant coach Steve McClaren. The following seasons saw Premier League security maintained as Middlesbrough slowly improved and were seen as a tough side to beat when playing at the Riverside Stadium. During McClaren's reign, Middlesbrough achieved their highest Premier League placing, finishing seventh in 2004–05. The 2004 League Cup Final at the Millennium Stadium. The 2003–04 season was the most successful in the club's history as they finally won a major trophy after beating Bolton Wanderers 2–1 in the League Cup final under Steve McClaren. This success also ensured that Middlesbrough would qualify for Europe – the UEFA Cup – for the first time, ultimately reaching the last 16 in the competition. UEFA Cup qualification was achieved for the second consecutive year after a dramatic 1–1 away draw with Manchester City thanks to a late penalty save from Mark Schwarzer in the final game of the season. Middlesbrough reached the 2006 UEFA Cup Final in Eindhoven, following two comebacks from 3–0 down in the rounds preceding it, but lost 4–0 to Sevilla. Following the cup final, McClaren left to manage the England national team, and captain Gareth Southgate took over. Despite not having the coaching qualifications, he was allowed to continue after receiving special dispensation. During the 2007–08 season, Southgate broke Middlesbrough's record transfer fee, paying £13.6 million for Brazilian international striker Afonso Alves. Southgate's first two seasons saw the club finish in 12th and 13th places. He oversaw the club reaching the quarter-finals of the FA Cup for three seasons, but the club was relegated to the Championship on the last day of the 2008–09 season. Southgate was sacked in October 2009 and replaced by Gordon Strachan. At the time of Southgate's dismissal, Boro were fourth in the Championship and only one point away from the automatic promotion spot, but their form under Strachan was significantly worse and they finished mid-table. Despite starting the 2010–11 campaign as promotion favourites, the club started the season poorly and Strachan resigned on 18 October, to be replaced by Tony Mowbray. Following a poor run of form in the 2013–14 campaign, Mowbray left the club with immediate effect on 24 October. Aitor Karanka, a former Spain international defender and assistant coach at Real Madrid to José Mourinho, became the new Middlesbrough manager, signing a two-year contract. He became the first non-British manager at the club, which finished the season 12th in the final league standings. In his first full season in charge, Middlesbrough finished fourth and thus qualified for the 2015 Football League play-offs. After seeing off Brentford 5–1 on aggregate in the semi-final, the club lost 0–2 to Norwich City at Wembley Stadium in the final. Under Karanka's tutelage, Patrick Bamford, on loan from Chelsea, won the Championship Player of the Year award for 2014–15. The next season, Middlesbrough were promoted back to the Premier League after finishing second in the Championship in 2015–16, drawing 1–1 with Brighton & Hove Albion on the final day of the season. Karanka was sacked in March 2017 following a poor run of form, and the club ended the season relegated in 19th place, won only 5 league games, and scored 27 goals, the lowest in the league. The club appointed former Leeds United manager Garry Monk as manager in the off-season. Expectations at the club were high, having spent close to £50 million in the transfer window on player purchases, in order to mount an immediate promotion challenge back to the Premier League. Monk left in December, with Middlesbrough ninth in the Championship and underachieving, and Tony Pulis was appointed as his replacement. Middlesbrough's original home kit upon election to the Football League in 1899 was a white home shirt with blue shorts and they did not adopt their colours of red and white until later that season. Previous kits included a white shirt with a blue and white polka dotted collar from around 1889. The Middlesbrough kit has remained broadly the same over the years with a red shirt, either red or white shorts, and socks. The distinctive broad white stripe across the chest was introduced by Jack Charlton in 1973 (following an attempt to change the home shirt to a Leeds United-style white shirt) and brought back for a one-off in 1997–98 and then again for the 2000–01 and 2004–05 seasons due to popular demand. The club subsequently announced in December 2007 that the club would allow the fans to decide via an online and text vote whether the white band should return for the following season. On 8 January 2008, the club announced that the white band was to return, with 77.4% of voters voting in its favour, with the fans to choose the final shirt design from a selection of three designs, of which the winner was announced on 7 May 2008. The Middlesbrough crest has gone through four changes since the formation of the club. Initially, the badge was simply the town of Middlesbrough's crest with a red lion instead of a blue lion in order to fit in with the club's colours. Following the adoption of the white band on the shirts in 1973, only the red lion remained with the letters "M.F.C" underneath in red. This was further adapted following the reformation of the club in 1986 to a circular crest with the lion in the middle and the words "Middlesbrough Football Club 1986" around the circle in order to reflect this new era. In 2007, Middlesbrough changed their crest again, this time with the lion inside a shield and the words "Middlesbrough Football Club 1876" underneath. The club stated that this was to reflect the club's long history and not just their post-liquidation status. After formation in 1876, and with the club still amateurs, Middlesbrough's first two years of football were played at Albert Park in Middlesbrough. After seeing the damage being caused by players and supporters, the Park Committee ordered the club to find an alternate venue. The club moved to Breckon Hill, behind the former Middlesbrough College longlands site, after agreeing to rent the land from its owner. However, two years later in 1880, the owner increased the rent and the club decided to move. They moved into the Linthorpe Road Ground in 1882, home at the time of Middlesbrough Cricket Club. The cricket club departed in 1893–94 to move to the Breckon Hill field, and Middlesbrough Football Club became sole users of the ground. With the club's growing size, and entry to the Football League, they had to move to a new ground in 1903, Ayresome Park. It was designed by Archibald Leitch and would be the club's home for the next 92 years, having also been chosen as one of the stadia for the 1966 FIFA World Cup. Following the Taylor Report in 1990, the ground either needed modernising or the club needed a new stadium. The club decided on the latter, and moved out at the end of the 1994–95 season. It was used as a training ground during 1995–96, before it was demolished in 1997 and a housing estate built in its place. The club now trains at a £7 million complex at Rockliffe Park, in Hurworth, on the outskirts of Darlington. The Riverside Stadium, named by the supporters of the club after a vote, became the club's home in 1995. It was the first stadium to be built in line with the Taylor Report's recommendations on all-seater stadiums for clubs in the top two divisions of the English football league system. It was originally a 30,000-seater stadium, constructed at a cost of £16 million, before it was expanded in 1998 to a capacity of 35,100 for an extra £5 million. Since then, several reorganisations of the Riverside Stadium have taken place. At the start of the 2013–14 season, away fans were moved from behind the goal in the South stand to the South East corner, while home fans are now situated behind both goals to help create a better atmosphere inside the stadium. A giant TV screen was also installed at the back of the South-East corner, replacing the older style scoreboards attached to the North and South stand roofs. For the start of the 2016–17 season (and a return to the Premier League), the club had to improve the stadium's broadcasting facilities and floodlighting in order to meet current Premier League requirements. The club also took the opportunity to move the main camera gantry to the back of the East stand where it now faces the main West stand. The current stadium capacity as of the 2017–18 season is 34,000. Average attendances at Middlesbrough matches have fluctuated over the past several years, moving from a 2004–05 high average of 32,012 to a low of 26,092 in 2006–07, then up again to 28,428 in 2008–09. Following relegation to the Championship, attendances dipped, although the crowd of 23,451 which saw Middlesbrough's first Championship game against Sheffield United represents far higher gates than is usual for the division, and indeed larger than those of some Premier League clubs. The club attracted an average of 24,627 for their 2015–16 promotion season from the Championship to the Premier League. Traditionally supporters come from Middlesbrough itself and towns in the immediate area. Middlesbrough have one of the highest proportions in Britain of locally born season ticket holders at 80%, and one of the highest proportions of female fans at 20%. A survey at the start of the 2007–08 season found Middlesbrough supporters were the seventh-loudest set of fans in the Premier League. Middlesbrough Official Supporters Club, which features its own team in the local football league, has links with supporters' clubs across the globe. The largest supporters' clubs include the Official Supporters' Club, the Middlesbrough Disabled Supporters' Association, Yarm Reds, Red Faction and Middlesbrough Supporters South. Middlesbrough supporters' main rivals are Sunderland (with whom they contest the Tees–Wear derby), Newcastle United (with whom they contest the Tyne–Tees derby), and Leeds United, a fact confirmed by planetfootball.com's 2004 survey. Carlisle United see Middlesbrough as their biggest rivals, but Middlesbrough supporters have not reciprocated, as they do not see Carlisle as a top three rival. You have the satisfaction of knowing that, although your team did not win the game, your supporters present in Eindhoven proved to the world that football fans can turn a match into a friendly, violence-free celebration. Middlesbrough fans had also been praised by Cleveland Police for their behaviour in previous rounds, particularly in the light of aggravation prior to and during the match at Roma. Middlesbrough was the first football club in the world to launch its own TV channel – Boro TV. The first broadcasts were tied to the club's first ever major cup final appearance in 1997, a full year ahead of Manchester United's MUTV, which still claims to be the first in the world. The channel was the brainchild of then NTL marketing director, Peter Wilcock. The programme became synonymous with former Middlesbrough star Bernie Slaven and radio commentator Alastair Brownlee who proved to be as popular on TV as they were on radio. Its programmes were not live initially but were pre-recorded and hosted by local radio/TV broadcaster & Boro fan, Dave Roberts. Boro TV went on to claim another first when in August 2001 it become the first English football club to broadcast time-delayed full-match footage of their league games on its own channel. Boro TV ran through NTL cable television until July 2005. The club now shows match highlights through a subscription-based scheme on its official website. Middlesbrough's official matchday programme, Redsquare, was Programme Monthly's 2006–07 Programme of the Year. There are numerous other fanzines available, most notably Fly Me to the Moon, formed in September 1988 following Bruce Rioch's quote to Tony Mowbray, stating "If I had to go to the moon I'd want him by my side". Middlesbrough Football Club in the Community (MFCIC) was founded in 1995 by club chairman Steve Gibson and is one of the largest community-based football schemes in the United Kingdom. It is run separately from the football club but receives support from both the club in terms of providing players, staff, stadium facilities and PR in the matchday programme and other publications, as well as support from other local organisations. Since 2002, the club and MFCIC have also run the Middlesbrough Enterprise Academy, a scheme which helps local children improve their entrepreneurial skills and increase their awareness of business planning and finance. In March 2008, plans were announced by the Premier League to roll out the scheme nationally amongst all Premier League clubs. It was announced in December 2007 that Middlesbrough football club had carried out more community work during 2006–07 than any other Premier League club, rising from second place the previous year, with the club making 318 appearances – almost twice the Premier League average of 162. They were in the top two for community appearances again in 2007–08, with 374 – a 17% increase on the previous season. Middlesbrough's mascot is Roary the Lion. The club runs Roary's Children's Charity Fund which purchases items for local children's charities. "Middlesbrough Football Club exists for the community, for the people of Teesside—and the closure of the steel plants threatens to rip the heart out of our community. We cannot stand by and allow that to happen. We want the steelworkers and their families to know that we are behind them and will help their campaign in any way we can ... We like to think that the football club is the flagship of Teesside. Well this is our town and these are our people and we have to do what we can to help them." For the team's reserve and Academy squads, see Middlesbrough F.C. Reserves and Academy. These 10 players were voted for by fans as part of a campaign with the Evening Gazette. These players made more than 430 appearances during their time at the club. The number in brackets indicates the number of appearances in all competitions. These players scored more than 140 goals during their time with the club. The number in brackets indicates the number of goals scored in all competitions. The Football League 100 Legends is a list of 100 legendary football players produced by The Football League in 1998, to celebrate the 100th season of League football. The English Football Hall of Fame is housed at The National Football Museum in Manchester, England. The Hall aims to celebrate and highlight the achievements of top English Footballers and Footballers who have played in England. These players appeared for or managed Middlesbrough at some point in their careers. The following former Middlesbrough players and managers have been inducted into the Scottish Football Hall of Fame. The following are all the full-time Middlesbrough managers since the club turned professional in 1899. ^ Hancox, Dan (10 September 2009). "How is Britain coping with the recession? – Middlesbrough – Smoggies steel themselves". New Statesman. Archived from the original on 10 October 2013. Retrieved 2 October 2013. ^ "Teesside MP uses the word "smoggie" in Parliament speech". Evening Gazette. 11 July 2011. Archived from the original on 2 October 2013. Retrieved 29 September 2013. ^ "Maximo Park fear for footy teams". BBC News. 22 April 2009. Archived from the original on 2 October 2013. Retrieved 29 September 2013. ^ "Riverside Stadium's new capacity confirmed after Boro's relegation to Championship". Gazette Live Website. 8 July 2017. Archived from the original on 11 July 2017. Retrieved 14 July 2017. ^ a b c "Boro FC club info". gazettelive.co.uk. Archived from the original on 4 September 2007. Retrieved 27 May 2008. ^ a b c d "Middlesbrough, Official Site of the Premier League". Premier League. Archived from the original on 22 February 2014. Retrieved 14 February 2014. ^ a b "Club rivalries uncovered" (PDF). footballfancensus. Archived from the original (PDF) on 20 October 2013. Retrieved 13 October 2007. ^ a b c "Boro lift Carling Cup". BBC Sport. 29 February 2004. Archived from the original on 26 April 2012. Retrieved 21 May 2007. ^ a b c d e f g Glasper, Harry. Middlesbrough A Complete Record 1876–1989. Breedon Books Sport. ISBN 0-907969-53-4. ^ a b c Matt Westcott (12 May 2007). "Boro change badge to reflect history". The Northern Echo. Archived from the original on 7 December 2008. Retrieved 10 October 2008. ^ "Club History – Birth of The Boro: 1876–1902". Middlesbrough F.C. Archived from the original on 16 November 2013. Retrieved 14 February 2014. ^ "Battling with the Boro for 125 years". Evening Gazette. 21 October 2003. Archived from the original on 21 February 2014. Retrieved 14 February 2014. ^ "Club History – Early Years: 1903-World War II". Middlesbrough F.C. Archived from the original on 23 February 2014. Retrieved 14 February 2014. ^ a b c d "League history". Middlesbrough Mad. Archived from the original on 2 April 2014. Retrieved 14 February 2014. ^ "George Camsell". gazettelive.co.uk. Archived from the original on 3 November 2007. Retrieved 26 May 2008. ^ Glanville, Brian (20 September 2004). "Obituary: Brian Clough". The Guardian. UK. Archived from the original on 30 September 2013. Retrieved 26 May 2008. ^ a b c "Club History – Mannion, Hardwick, Clough and Charlton: 1945 to 1986". Middlesbrough F.C. Archived from the original on 14 February 2014. Retrieved 14 February 2014. ^ "Anglo-Scottish Cup 1975–1976: Final". Statto. Archived from the original on 22 February 2014. Retrieved 14 February 2014. ^ Gillett, Alex G.; Tennent, Kevin D.; Hutchinson, Fred (2016). "Beer and the Boro – A Perfect Match!". In Cabras, Ignazio; Higgins, David Minden; Preece, David (eds.). Beer, Pubs and Brewing: A Global Perspective. Basingstoke: Palgrave Macmillan. pp. 303–320. ISBN 9781137466174. ^ "Just 37 days to save our club". gazettelive.co.uk. Archived from the original on 21 February 2014. Retrieved 14 February 2014. ^ "Uefa final caps Boro fairytale". BBC. 14 February 2014. Retrieved 25 May 2008. ^ a b c "Club History – Winners at Last! 1986 to present". Middlesbrough F.C. Archived from the original on 26 July 2012. Retrieved 14 February 2014. ^ "Manchester United: The Sir Alex Era – Part 1". BBC. Archived from the original on 27 February 2008. Retrieved 28 May 2007. ^ "Anthony Vickers' countdown of Boro's top 40 signings". Gazette Live. Archived from the original on 17 January 2014. Retrieved 14 February 2014. ^ "Season 1996/97". Premier League. Archived from the original on 10 December 2011. Retrieved 27 May 2008. ^ Rich, Tim (16 May 2005). "City pay the penalty for Fowler miss". The Daily Telegraph. UK. Archived from the original on 25 February 2014. Retrieved 14 February 2014. ^ "Middlesbrough 4–1 Basle". BBC Sport. 6 April 2004. Archived from the original on 13 December 2006. Retrieved 28 May 2007. ^ "M'brough 4–2 S B'chrst". BBC Sport. 27 April 2004. Archived from the original on 6 January 2007. Retrieved 28 May 2007. ^ a b "Sevilla run away with trophy". UEFA. Archived from the original on 22 February 2014. Retrieved 14 February 2014. ^ Stewart, Rob (23 November 2006). "Southgate wins coaching badges appeal". The Daily Telegraph. UK. Archived from the original on 24 March 2014. Retrieved 14 February 2014. ^ Bright, Richard (6 February 2008). "Afonso Alves eyes Middlesbrough debut". The Daily Telegraph. UK. Archived from the original on 24 March 2014. Retrieved 14 February 2014. ^ McNulty, Phil (24 May 2009). "Aston Villa 1-0 Newcastle". BBC Sport. Archived from the original on 12 September 2018. Retrieved 6 May 2018. ^ "Gordon Strachan confirmed as Middlesbrough's new manager". The Guardian. UK. 26 October 2009. Archived from the original on 4 December 2013. Retrieved 26 October 2009. ^ "Middlesbrough 2009–2010: English League Championship Table on 21 October 2009". Archived from the original on 22 February 2014. Retrieved 14 February 2014. ^ "Middlesbrough 2009–2010: English League Championship Table at end of season". Archived from the original on 22 February 2014. Retrieved 14 February 2014. ^ "Middlesbrough name Tony Mowbray as new manager". BBC Sport. 26 October 2010. Archived from the original on 13 January 2016. Retrieved 18 March 2012. ^ "Middlesbrough | Tony Mowbray Leaves Boro". Middlesbrough F.C. Archived from the original on 24 October 2013. Retrieved 8 December 2013. ^ "Aitor Karanka: Middlesbrough name ex-Real Madrid man as boss". BBC Sport. 13 November 2013. Archived from the original on 16 November 2013. Retrieved 8 December 2013. ^ Taylor, Louise (7 May 2016). "Middlesbrough promoted to Premier League after 1-1 draw with Brighton". The Guardian. Archived from the original on 7 July 2018. Retrieved 6 May 2018. ^ Smith, Jamie (8 May 2017). "Middlesbrough's Premier League relegation confirmed". Goal.com. Archived from the original on 7 May 2018. Retrieved 6 May 2018. ^ Hardy, Martin (1 September 2017). "Middlesbrough are eyeing promotion at the first attempt - after £50m spend Garry Monk knows he must deliver". The Independent. Archived from the original on 26 December 2017. Retrieved 29 January 2018. ^ @Boro (23 December 2017). "Middlesbrough Football Club have parted company with manager Garry Monk" (Tweet) – via Twitter. ^ "Garry Monk: Middlesbrough part company with manager despite victory". BBC Sport. 23 December 2017. Archived from the original on 23 December 2017. Retrieved 23 December 2017. ^ "Tony Pulis appointed as new Boro manager". Middlesbrough Football Club. 26 December 2017. Archived from the original on 26 December 2017. Retrieved 26 December 2017. ^ "Middlesbrough F.C. kits". kitclassics.co.uk. Archived from the original on 17 April 2007. Retrieved 21 May 2007. ^ "Middlesbrough". Historical Football Kits. Archived from the original on 1 October 2007. Retrieved 21 May 2008. ^ a b "Take Part in Boro's Battle of the Band". Middlesbrough F.C. 30 December 2007. Archived from the original on 14 February 2014. Retrieved 14 February 2014. ^ "We're Backing The Band". Middlesbrough F.C. 8 January 2008. Archived from the original on 14 February 2014. Retrieved 14 February 2014. ^ "The Band Is Back!". Middlesbrough F.C. 7 May 2008. Archived from the original on 14 February 2014. Retrieved 14 February 2014. ^ "Errea dropped in favour of global brand adidas". Evening Gazette. 31 March 2009. Archived from the original on 21 February 2014. Retrieved 14 February 2014. ^ a b "Road to the Riverside". Middlesbrough F.C. Archived from the original on 3 December 2013. Retrieved 14 February 2014. ^ "Rockliffe Park". Middlesbrough F.C. Archived from the original on 13 February 2014. Retrieved 14 February 2014. ^ "The Riverside Stadium". Middlesbrough F.C. Archived from the original on 2 September 2013. Retrieved 14 February 2014. ^ Tallentire, Philip (13 March 2013). "Reorganisation of Riverside Stadium given go-ahead". Gazette Live. Archived from the original on 2 December 2013. Retrieved 8 December 2013. ^ "Coral – Middlesbrough partnership continues – Slotsday". Slotsday. 6 August 2017. Archived from the original on 6 August 2017. Retrieved 6 August 2017. ^ "Football's Rich Pickings". BBC. 25 May 2001. Archived from the original on 7 March 2012. Retrieved 23 May 2007. ^ "Premier League – Noise League Table". Yahoo! Sport. 26 October 2007. Archived from the original on 28 October 2007. Retrieved 27 October 2007. ^ a b "Supporters' Clubs". Middlesbrough F.C. Archived from the original on 5 December 2013. Retrieved 14 February 2014. ^ "Football club bans gas masks". BBC News. 5 March 2003. Archived from the original on 11 November 2005. Retrieved 26 May 2008. ^ "Banners". Middlesbrough F.C. Archived from the original on 26 March 2011. Retrieved 14 February 2014. ^ "'Impeccable' Boro fans win praise". Northern Echo. 20 May 2006. Archived from the original on 4 March 2016. Retrieved 14 February 2014. ^ "Boro fans praised for behaviour". BBC News. 16 March 2006. Archived from the original on 13 January 2016. Retrieved 31 August 2007. ^ "Football: Television the new Slaven trade". 29 March 1998. Archived from the original on 30 September 2017. Retrieved 4 December 2017. ^ "Boro first to take advantage of new TV rights regulations". sportbusiness.com. 31 August 2001. Archived from the original on 17 August 2012. Retrieved 31 August 2007. ^ "Boro television channel to close". BBC Sport. 1 July 2005. Archived from the original on 13 January 2016. Retrieved 31 August 2007. ^ "Official website". Middlesbrough F.C. Archived from the original on 7 September 2008. Retrieved 31 August 2007. ^ "Success is taken as read (section title)". Evening Gazette. 14 March 2007. Archived from the original on 7 November 2010. Retrieved 10 October 2008. ^ Fraser, Alan (13 April 2008). "Mowbray, the 'miserable sod' whose life was truly kissed by an angel". Daily Mail. UK. Archived from the original on 27 September 2008. Retrieved 3 April 2008. ^ "MFC Foundation Launched". Middlesbrough F.C. Archived from the original on 11 December 2013. Retrieved 14 February 2014. ^ "Blair Praises Community Role". Middlesbrough F.C. Archived from the original on 14 February 2014. Retrieved 14 February 2014. ^ "Funders and Sponsors". mfcic.co.uk. Archived from the original on 19 May 2007. Retrieved 10 December 2007. ^ "Boro Inspire Enterprise Push". Middlesbrough F.C. 14 March 2008. Archived from the original on 14 February 2014. Retrieved 14 February 2014. ^ "Boro are charity champs". Evening Gazette. 10 December 2007. Archived from the original on 21 February 2014. Retrieved 14 February 2014. ^ "Boro Heroes Star in the Community". Middlesbrough F.C. 24 December 2008. Archived from the original on 18 April 2009. Retrieved 24 December 2008. ^ "Boro's Annual Charter Report". Middlesbrough F.C. Archived from the original on 3 March 2009. Retrieved 26 January 2008. ^ a b "Boro's Steel Fight Goes On". Middlesbrough F.C. 16 September 2009. Archived from the original on 14 February 2014. Retrieved 14 February 2014. ^ Second tier / Football League Championship of English football. ^ "Boro's nearly men". BBC Sport. 12 April 2002. Archived from the original on 13 January 2016. Retrieved 26 May 2008. ^ "Other Records". middlesbrough-mad.co.uk. Archived from the original on 2 April 2014. Retrieved 14 February 2014. ^ "Kirin Cup". Archived from the original on 21 August 2007. Retrieved 31 August 2007. ^ "First Team". Middlesbrough F.C. Retrieved 18 April 2019. ^ "Ste Walker Makes MK Dons Loan Move". mfc.co.uk. Middlesbrough F.C. Retrieved 31 January 2019. ^ "Boro Legends". Evening Gazette. 13 August 2007. Archived from the original on 23 January 2008. Retrieved 1 August 2009. ^ a b Rollin, Glenda & Rollin, Jack (2006). Sky Sports Football Yearbook 2006–2007. Headline. ISBN 0-7553-1526-X. ^ "Little fella with a lot of heart". Evening Gazette. 26 August 2004. Archived from the original on 10 February 2012. Retrieved 18 June 2008. ^ "Downing nets yet another top title". Evening Gazette. 17 May 2005. Archived from the original on 10 February 2012. Retrieved 18 May 2008. ^ "Match that!". Evening Gazette. 10 May 2006. Archived from the original on 10 February 2012. Retrieved 18 June 2008. ^ "Tuncay's the main man in Boro award tribute". Evening Gazette. 22 May 2009. Archived from the original on 2 June 2009. Retrieved 22 May 2009. ^ "Joe Wins Ramsdens Award". MFC.co.uk. Archived from the original on 27 September 2012. Retrieved 11 May 2011. ^ "Robson Leaves On A High". MFC.co.uk. Archived from the original on 3 May 2012. Retrieved 30 April 2012. ^ "Players' Stars Of The Season". MFC.co.uk. Archived from the original on 15 May 2013. Retrieved 6 May 2013. ^ "George Friend has completed a clean sweep by winning Player of the Year and Players' Player of the Year at Boro's End Of Season Awards". Middlesbrough FC. 4 May 2014. Archived from the original on 23 April 2016. Retrieved 1 March 2018. ^ "Sport: Football Legends list in full". BBC News. 5 August 1998. Archived from the original on 12 January 2016. Retrieved 31 August 2007. ^ "Hall of Fame". National Football Museum. Archived from the original on 11 August 2007. Retrieved 31 August 2007. ^ "MFC History – Managers". Middlesbrough F.C. Archived from the original on 6 June 2013. Retrieved 14 February 2014. Wikimedia Commons has media related to Middlesbrough F.C..